Easter Weekend 2019 is going to be HUGE at The WORD Church! Last year’s Easter Eggstravaganza was huge success and with the help of our community partners, the Rotary Club Of West U and the YMCA, this year’s Eggstravaganza is going to be even better! 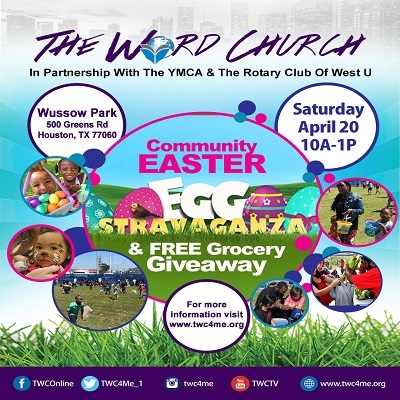 This FREE Community event is open for children of all ages and will include a petting zoo, games, prizes, health screenings by MD Anderson, face painting, FREE Grocery Giveaway, a egg hunt with thousands of eggs and more! Grab the kids, tell a neighbor, tell a friend and come on to Tom Wussow Park (500 Greens Rd. Hou, 77060) for a great day of fun activities for the family. (Please bring your child a bag or Easter Basket to collect their eggs during the hunt) See you Saturday, April 20 at 10am! CLICK HERE To Sign Up to VOLUNTEER at this event.